“He was a character beyond imagination,” said business associate Thomas Quinn after the 1988 death of Bart Salerno, an entrepreneur who started WREF, fed Olympic athletes, renovated old buildings, and enjoyed talking to anyone who struck his fancy. After the war, he graduated from Springfield College and became a teacher. He moved to town in 1954 when he was teaching art at Ridgefield High School after earning a master’s degree at Danbury Teachers College. A year later, he bought the carriage house of opera singer Geraldine Farrar and converted it to a home off Silver Spring Road. He operated Bart Associates, a real estate and insurance firm, which for many years operated out of a converted freezer building on Danbury Road. But he had many other interests. For instance, he spent 15 years getting licensing and antenna approval for WREF, Ridgefield’s AM radio station. In its early years under Salerno's ownership, WREF broadcast local news and programming but has since become a totally automated, computer-operated, oldies rock station with no local coverage at all. He was a small-scale developer who also owned apartment buildings and other properties. His largest development was the subdivision of the former Firestone estate in the northwestern corner of Wilton. 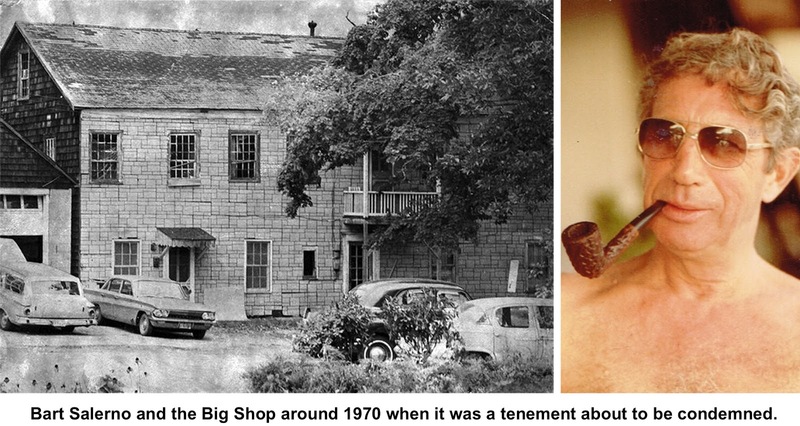 Perhaps his most important contribution to Ridgefield was his renovation of the Big Shop, the early 1800s hall and factory that Hannibal Hamlin, as vice president under Abraham Lincoln, spoke in, and that had been a center of Ridgefield industry in the 1800s. 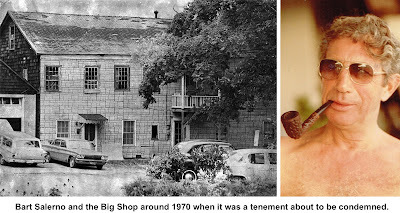 The large building had stood at West Lane and Main Streets but when the “new” First Congregational Church was about to be built in 1888, the Big Shop was moved to the center of the village. By the 1970s, it had become a run-down tenement and had reached the point where the town condemned it as unsafe for human occupancy. Salerno bought it, carefully restored and remodeled it, and now the handsome Big Shop holds restaurants, shops and offices at the north end of the Bailey Avenue parking lot. Salerno had an eye for a winner, as demonstrated in 1977 when he sponsored Karen Kopins in a Miss Ridgefield pageant. She went on to become Miss Connecticut, competed in Miss America, and wound up an actress who appeared in movies and TV series. He part-owned the company that fed the athletes at the 1980 Olympics in Lake Placid and then supplied food to the American team at Sarajevo in 1984. “He was happiest around peasants and poor people,” said Quinn, another partner in the food service company. Instead of hanging around formal functions in Sarajevo, Salerno could often be found playing cards with the locals. When he did join in the formalities, he was sometimes lost. “I can remember him sitting next to John Denver and Kirk Douglas and calling John Denver Kirk Douglas and Kirk Douglas John Denver,” Quinn said with a smile. Salerno was 64 when he died while on a visit to Florida.